Over the past 12 to 18 months the mobile division of KDDI, known here as ‘au,’ has been leading the way in Japan’s cellular marketplace. During a recent interview at the 3G World Forum, one European visitor asked the seemingly obvious question, “What is the main reason for their success?” The reasonable answer is that it’s actually a combination of several factors, but one thing stands out. Compared to the NTT DoCoMo and Vodafone business models, au has a very tight focus on the domestic market. Their attention to detail in customer service and product offerings is not challenged by how the product mix and content offerings might fit into the company’s global strategy — and it shows. This has allowed au to take the lead in areas like GPS, flat-rate data and faster networks, all provided to the consumer on affordable price plans. The carrier now offers a full suite of popular and useful services ranging from Navitime, EZ auctions, EZ book, EZ channel, EZ games, and EZ FM to (recently introduced) mobile IM (‘Hello Messenger’), mobile blogging (‘DuoBlog’) and Lismo. Looking again at au’s recent blitz of cutting-edge models, just in time for Japan’s peak spring sales season, at Designing Studio last week, we were truly impressed; it will be a tough choice for shoppers. The phones and services strongly illustrate one of the most fundamental and important learnings about Japan’s mobile success that we’ve been trumpeting for years (WWJ subscribers log in for more text, conclusion and a link to a very cool online demo of au’s latest phones). As we have said many times here on WWJ, the physical hardware in the customer’s hand is the most important element in mobile Internet success. Simply put: A quality handset is crucial. The W41T by Toshiba, with a 4-GB internal hard drive, a 3.2-megapixel camera and Bluetooth, and the W41H from Hitachi, the first model introduced to date for Japan’s April 1st launch of ‘One-Seg’ digital TV broadcasts and also including an embedded FeliCa IC chip, both illustrate just how far these formerly also-ran, second-tier suppliers have come. 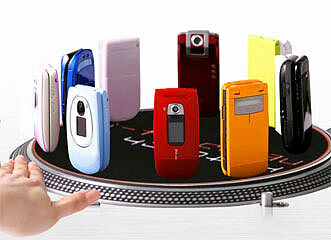 The new Casio, Kyocera, Sanyo, Sony Ericsson and custom in-house designed Neon models are also impressive. There was a time when national flagship carrier NTT DoCoMo wouldn’t deign to source a phone from second-tier wanna-bees, preferring instead to deal exclusively with the Big Five makers: Panasonic, NEC, Fujitsu, Sony and Mitsubishi. Sure, in the 2G and 2.5G era, every now and again Big D would offer a one-off model from a Hitachi or a Kyocera, but that was about it. Over all, au’s new line up demonstrates how far the (mostly) Japan-market-only handset makers have come in the last few years compared to the top-ranked makers, which — like their carrier patrons DoCoMo and Vodafone — have been trying to boost their sales overseas as well. KDDI/au’s lesson for mobile business success seems not only to be ‘define a niche then occupy it’ but also ‘know your customer’ and ‘maintain a tight domestic focus.’ Entangled as they are with overseas adventures, DoCoMo and Vodafone Japan haven’t a hope of catching up. P.S. Touch and try the new au models for yourself at this extremely cool Flash-based site.